He is generally referred to as the father of Polish national opera. Moniuszko was born in Ubiel, Minsk Governorate (in present-day Belarus) in 1819 to a Szlachta of landowners from the eastern fringe of the Vilna Governorate of the already partitioned Polish–Lithuanian Commonwealth, its eastern subject, Grand Duchy of Lithuania. His mother (maiden-name Madziarska) had Polish-Hungarian-Armenian roots. Moniuszko displayed an early ability in music, and began private piano lessons with August Freyer in 1827. In 1837, once his talent and interest justified it, Moniuszko began to formally study composition in Berlin with Carl Friedrich Rungenhagen, the director of the "Singakademie" Music Society, who also instructed him in choral conducting. At the same time Moniuszko studied major works of the classical repertoire as well as the process involved in staging music. While in Berlin, he had an unexpected early success when he set three songs to the words of the Polish national poet, Adam Mickiewicz. Several of his songs composed during this period were published by Bote & Bock and were favorably received by the music critics. After three years in Berlin, he returned to Poland in 1840 to marry Aleksandra Müller. 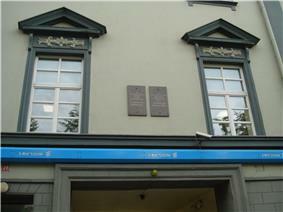 He obtained a post as an Vilnius and also worked as a private piano tutor. He often had to face financial difficulties, especially as his happy married life was blessed with an ever growing family. The Moniuszkos had ten children and together with the nurses and servants there came a time when 18 people sat down at their table every day. He contributed greatly to music in the local area, staging performances of large choral works such as Mozart's requiem, and excerpts from Haydn's The Creation and Mendelssohn's St. Paul. There were also orchestral performances of works by Spontini, Mendelssohn and Beethoven. During that time he became acquainted with the novelist Józef Ignacy Kraszewski and playwright-satirist Aleksander Fredro, who stimulated his interest in dramatic music. Around 1840, he began to compose intensively, writing his first operas and several other stage works, as well as sacred music and secular cantatas. At around this time he began work on the collection of songs entitled Śpiewnik domowy (Songbook for Home Use), which came to have wide appeal to Polish public. The first volume of this collection was published in 1843 and over the years the collection grew to 12 volumes containing 267 songs with piano accompaniment in total. During his lifetime Moniuszko traveled numerous times to Alexander Serov, and his style was appreciated by Hans von Bülow. Serov, the young Russian critic of the time, referred to Moniuszko's compositions as "brilliant works". He was the mentor of César Cui. Most crucial to Moniuszko's career was, however, his visit to Warsaw in 1848. He met there Jozef Sikorski, the future editor of the most notable Polish music journal "Ruch Muzyczny" (Musical Movement), Oscar Kolberg a well-known folk song collector, and Włodzimierz Wolski, a poet and future librettist of Moniuszko's best known opera Halka. In 1848 in Vilnius, he staged and conducted the premiere performance of the first, two act version of his opera Halka. It took ten years before the political climate cooled enough to be able to perform such a nationalist-themed opera again. After the triumph of his new four-act version of Halka during the Warsaw premiere on 1 January 1858, he toured France, thanks to the help of the pianist Maria Kalergis, where he met Auber and Rossini. After a visit to Berlin, he met Smetana in Prague, who prepared the Prague premiere of Halka, and finally Moniuszko visited Weimar, where he met Liszt. Named after its heroine, Halka, after being shown in two acts in 1848 in Vilnius, was premiered with great success in 1858 in Warsaw in its final four act form. On that evening the composer, shy and limping slightly, thanked the audience, bowing many times to incessant applause. It was soon later staged in Prague, Moscow and St. Petersburg, where it met with great success. On 1 August 1858 he was appointed principal conductor of the Polish Opera in the Grand Theatre in Warsaw. He wasted no time in staging his opera Flis later that year, and during his 15 year tenure he conducted almost solely his own work. In 1862 Moniuszko travelled to Paris again, hoping to have one of his operas staged there, but this didn't happen. His early return from France, was due to a change in the political climate caused by the January Uprising, which was unfavourable to artistic activity. Moniuszko's composition was affected. 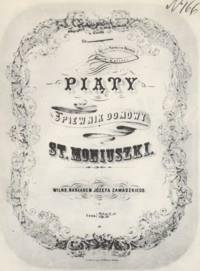 In 1864, Moniuszko started lecturing in harmony, counterpoint and composition in the Music Institute in Warsaw, where he also directed a choir. His disciples included, among others, Zygmunt Noskowski and Henryk Jarecki. In 1865, a staging of his Straszny Dwór (The Haunted Manor) enjoyed an enthusiastic reception, and his new opera proved to be a success comparable to that of Halka. From the success of Halka to other major operatic compositions; Flis (The Raftsman), 1858, Hrabina (The Countess), 1860, Verbum Nobile, 1861, and most importantly Straszny Dwór, 1865. The common trait shared by all these works are librettos that—while depicting Polish nobility and gentry, and sometimes characters of common origins—emphasized Polish customs and traditions, and at the time of national strife, sustained and fostered patriotic feelings. Stanisław Moniuszko died on 4 June 1872 in Warsaw of a sudden heart attack and was buried in Powązki Cemetery. His burial ceremony becoming a national event and his music became widely acclaimed in Poland and generally accepted as a paragon of "Slavonic" music. 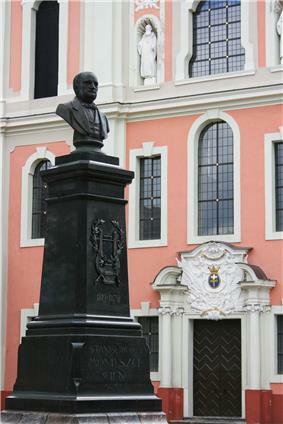 There is a bust monument built in his honor in the Old Town of Vilnius in the middle of the square of his name. His series of twelve song books, Śpiewnik domowy (Songbook for Home Use), are notable for sheer number as well as quality. Though many of the songs are simple, predominately strophic, some take on a form of dialogues or ballads, and the majority testify to the composer's originality and melodic inventiveness. The source of Moniuszko's melodies and rhythmic patterns often lies in Polish and Belarusian musical folklore; the majority of the texts are those of some prominent Polish poets, of whom many traced their roots from what is now Belarus (where of Litvin origin): Mickiewicz, Pol, Kraszewski Syrokomla, Lenartowicz, Czeczot, Odyniec, Dunin-Martsinkyevich. Due to the current obscurity of Moniuszko outside Poland, this list more or less represents a complete discography. Halka: Harmonia Mundi/Chant du Monde? Новае неба Станіслава Манюшкі: Classic Avantgarde ensemble (Belarus). CD, 2008. ^ Аляксей Хадыка, Станіслаў Манюшка — паляк, літвін... at the Wayback Machine (archived July 27, 2011) Novy Chas.org, Culture. Retrieved from the Internet Archive, February 18, 2013. ^ Jan T. Z. (24 IV 2005) Polscy Ormianie (Вспоминая геноцид Армян. Польские армяне) (Polish) Retrieved February 18, 2013. ^ a b c d e f g University of Southern California: Polish Music Center |Stanisław Moniuszko Retrieved February 18, 2013. ^ Teatr Wielki |"Teatralny Square and its environs"
NYTimes.com | Review of the "Haunted Manor"